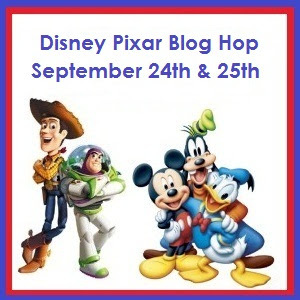 It is my pleasure to participate in the original and most-fantastic Disney Pixar Blog Hop. This is my third time hopping along with these fine friends. Scroll down, and I will post links to my original projects, which still make me smile. 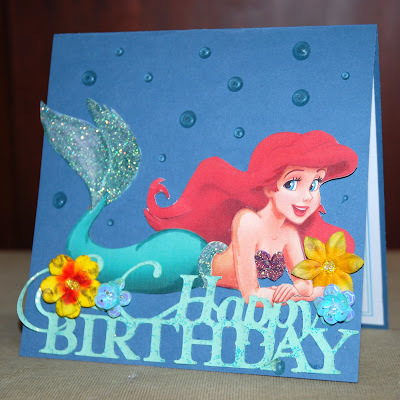 For this card, I fussy-cut an image of Ariel from a special Disney paper. Then I photocopied the paper so I could use the copy as a template to cut paper pieces from silver glitter stock for Ariel's fins, waistband and bra. I colored the glitter stock using my Copic markers in the colors of my choice. The HAPPY BIRTHDAY was cut using my Cricut Elegant Cakes cartridge. After I glued it to the paper surface, I highlighted the text using a wash of Stickles in aqua. I embellished the card using flowers that I sprayed with my homemade glimmer mist, as well as some Creative Charms sequined flowers. I also dimensionally lifted her arms, hand and hair, using pop-dots under those areas. The "water bubbles" were made using Ranger's "Glossy Accents." 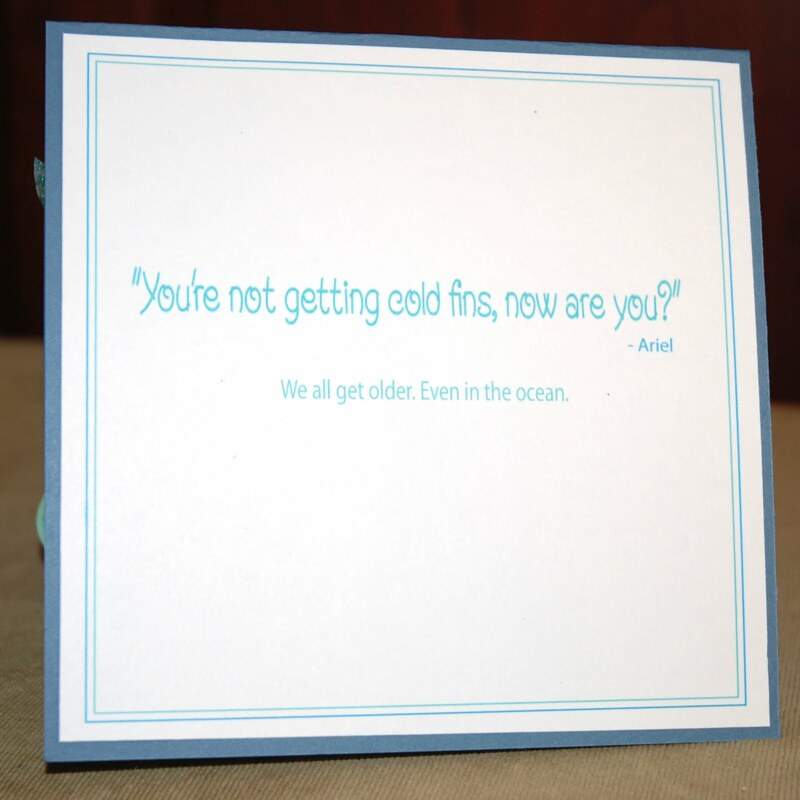 Here's the inside sentiment -- a quote from Ariel! For this card, I used a Cuttlebug Disney die to cut the silhouette from black paper. I mounted it on vellum, intentionally curving the zig-zag edges to make it look more "comic." I then mounted the vellum on Disney dotted specialized paper, then on red, then on green and then on the card. I cut green mistletoe and a flower (also using the die) and highlighted Minnie's flower by using a Creative Charms flower embellishment. Thank you for "following" me here on CardMonkey, and also for commenting. Those who do are eligible for my personal blog candy. What is it, you ask? I'm giving you a specially-assembled (by me!) 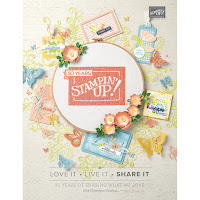 Disney kit of all sorts of cuts, embellishments and papers!! Don't forget to follow CardMonkey and comment for a chance to win candy! Hi Ellen hopping by to check out your Hop projects. I love your cards. I love how you paper pieced Ariel's fins, waistband and bra from a photo copy. Very creative. Very nice Ellen! I love that die cut and tried ordering one about a year ago, but they were clearanced and then out of stock. :( Thank you for being part of our hop again! I love your cards!! Beautiful job on both!! The mickey/Minnie silhoutte is so creative and love the little mistletoe! Just kiss the girl! OMG, you do not know how many times in college my friend Heather and I watched Littler Mermaid . . . usually after a few drinks and we would be singing the songs so loud and dancing around the living room!!! I love both of your cards. The wet look of the bubbles on the Little Mermaid one is GREAT, and I might need to borrow that Christmas card idea. cute cards!!! I love the little mermaid one, gorgeous! I am already a follower here. I love both of these cars, but the Ariel is my favorite! Absolutely beautiful! 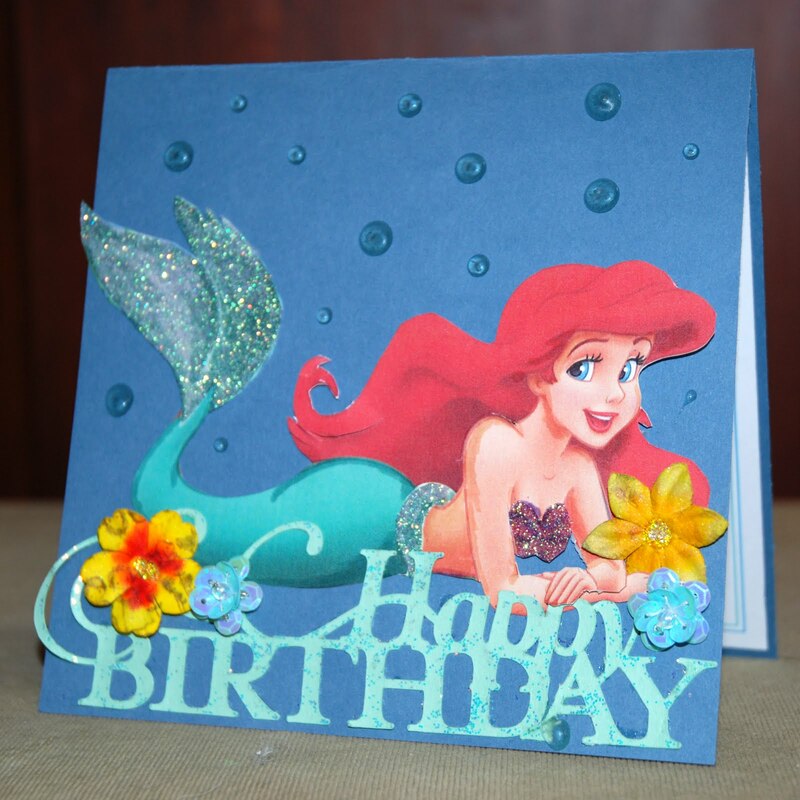 I love your cards-Ariel has always been my favorite princess! I love your music, too! What cute cards!!! The Mickey and Minnie are adorable! 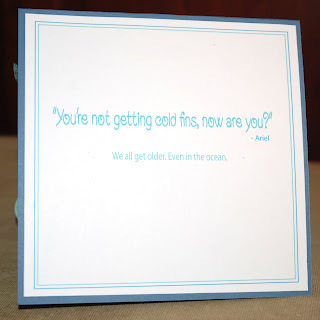 Love the sentiment in the Ariel card! So glad to be hopping with you!! Good morning Ellen, these turned out great. I especially love the Ariel card. The glitter & the bubbles were a perfect touch! Both cards are wonderful, I love the bubbles on the first card, and I will be using it on my water projects for now on. Arial turn out just so beautiful! Great cards! I love the detail on the Ariel card! Thanks for the chance to win! I really like your Minnie Mickey card ~ your blog is so inviting thanks for sharing your wonderful ideas and amazing talents! Long time now see...it was nice to start the hop and see your name included! I really love both your cards! The bubbles and glitter elements on Ariel are so cute. I really like the shadow effect on the MM and MM Christmas Card, too! Great Job! Love that Christmas card and I would love to win YOUR candy. I am a new follower and will be back often. This Ariel card is amazing!! I am in LOVE with your cards! The bubbles on Ariel's card are geneous! I didn't even know Cuttlebug had disney dies. Mounting that cut on vellum was a super great idea! I love your cards. Both of them are just adorable!! I love all the extra added sparkly accents you add! so so so cute ..love you project and thanks for sharing your talent!!!! 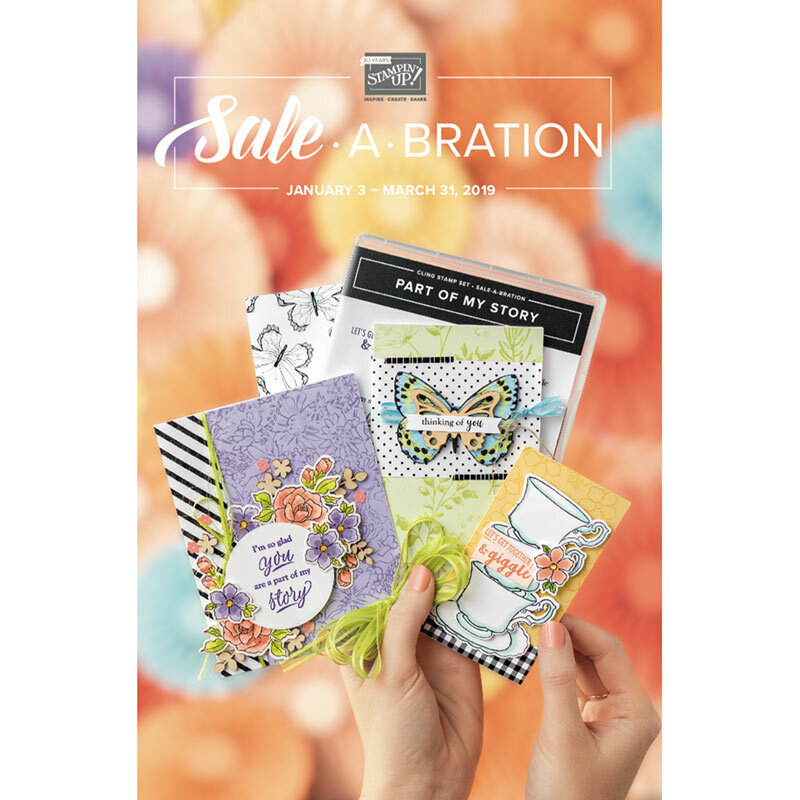 love the aqua stickles on the first card. Cute. Wonderful cards - and great use of the Creative Charms accents. I see that the enabling has worked again! The glitter sections you added to Ariel look fantastic - what a good idea to color them with the Copics to get just the right shade. Very cute cards. And what a great prize too! Since I don't have the Disny cartridges...It would be great for my new grandson's pages! Awesome cards - I love both of them! Silhouettes always are so effective! Love both your cards but Arial is so cute and what a great job you did on it with the paper piecing!! TFS!!! Hi, I am having soooo muh fun on your blog page. Music is fun, your cards are the BESTEST! I can't decide which one I like better, but I think Ariel wins since she is my 3 grand-daughters fav Princess and they would love this card. They are in Disney today. Thanks for sharing and since I am a follower, please when the hop is done, stop on by. Wow love the Ariel card sooo beautiful and the Mickey/Minnie Christmas card is just tooo cute. Great cards!! Thanks for sharing!! Great cards!! Ariel card is my favorite!! Ariel was my daughter favourite Disney Character when she was little. I love your project. The card was so cute too. Cute cards! My daughter's favorite movie is Little Mermaid. Thanks for sharing! Such fun cards! Love how you copied and paper pieced on the Ariel card. Really think the Christmas card is creative, cute, and unique. TFS and thanks for the chance to win. I love the projects you made- the mickey and minnie is darn cute! Love the bling you added to Ariel. New follower here... love the cards!! Cute idea on the silhouette mickey and minnie! Like the cards. Especially like the Mickey & Minnie with mistletoe for Christmas. I worked for the Mouse as in Disney World FL thru high school & college and like Pixar animated films. Thanks for chance to win. I LOVE the Christmas card!!! Disney and Christmas, 2 of my favorite things. TFS. I'm now a follower, and will for sure look at back projects! Wow I love both of your cards!! TFS!! I am a new follower...thanks for the chance to win. I love your cards. I have the same Mickey Die, just have yet to use it! Thanks for sharing it with us, I am a new follower. I love your blog. Great Disney cars - love the Mickey/Minnie Christmas one! Love, love, love Ariel!!! I was going to grow up to be her.....but sadly I never grew fins!! That is an amazing card you made and I will have to keep it in mind!!! And the mistletoe shilouettte card is also soooo cute!! Thanks for the wonderful projects because I love these Disney Blog hops!! What an artistic card design ... on both of them!!! Super nice!!! Such cute projects. I love Disney! Both your cards are adorable, I like the profile one best, Thanks for sharing. love it. Very cute cards! I'm a new follower. Love both cards. Ariel is amazing. Thanks for sharing. I love the silouhette card. Thank you for the chance to win your specially selected Disney goodies. Very nice cards!! Thanks for the chance to win!! Great cards. Your Ariel card is just beautiful! I also absolutely love that font. I'm thinking I am gonna have to get that cart. There goes another one on the wish list haha. Love both the cards! Great job!! I'm in love with the Ariel card!!!!!!! toooooo cute! Such pretty cards!! It has been a great hop! such cute cards! Thanks for the chance to win! Adorable cards!!! Just too cute. The Disney Pixar Hop Continues Today! Winner - One for the Little Guy! Still lovin' after all these years! Christmas Countdown: 100 Days 'til the Big Guy! See me as Guest Designer this week!